Seijkens, T.T.P., van Tiel, C.M., Kusters, P.J.H., Pascal, J.H., Atzler, D., Soehnlein, O., Zarzycka, B., Aarts, S.A.B.M., Lameijer, M., M.A., Gijbels, M.J., Beckers, L., den Toom, M., Slütter, B., Kuiper, J., Duchene, J., Aslani, M., Megens, R., van ‘t Veer, C., Kooij, G., Schrijver, R., Hoekseman, M., Boon, L., Fay, F., Tang, J., Baxter, S., Jongejan, A., Moerland, P.D., Vriend, G., Bleijlevens, B., Fisher, E.A., Duivenvoorden, R., Gerdes, N., de Winther, M.P.J., Nicolaes, G.A.F., Mulder, W.J.M., Weber, C., Lutgens, E.
Inhibition of CD40-TRAF6 interactions by the small molecule inhibitor 6877002 reduces neuroinflammation. Aarts SABM, Seijkens TTP, Kusters PJH, van der Pol SMA, Zarzycka B, Heijnen PDAM, Beckers L, den Toom M, Gijbels MJJ, Boon L, Weber C, de Vries HE, Nicolaes GAF, Dijkstra CD, Kooij G, Lutgens E.
von Hundelshausen P, Agten SM, Eckardt V, Blanchet X, Schmitt MM, Ippel H, Neideck C, Bidzhekov K, Leberzammer J, Wichapong K, Faussner A, Drechsler M, Grommes J, van Geffen JP, Li H, Ortega-Gomez A, Megens RT, Naumann R, Dijkgraaf I, Nicolaes GAF, Döring Y, Soehnlein O, Lutgens E, Heemskerk JW, Koenen RR, Mayo KH, Hackeng TM, Weber C.
Presence of Cytotoxic Extracellular Histones in Machine Perfusate of Donation After Circulatory Death Kidneys. Structure-based design of peptidic inhibitors of the interaction between CCL5 and HNP1. Wichapong, K., Alard, J., Ortega-Gomez, A., Weber, C., Hackeng, T.M., Soehnlein, O. and G.A.F. Nicolaes. Pharmacological targeting of AMP-activated protein kinase and opportunities for computer-aided drug design. Miglianico, M., Nicolaes, G.A.F., Neumann, D.
Stabilisation of protein-protein interaction complexes through small molecules. Zarzycka, B., Kuenemann, M.A., Miteva, M., Nicolaes, G.A.F., Vriend, G., Sperandio, O.
Labbé, C.M., Kuenemann, M.A., Zarzycka, B., Vriend, G., Nicolaes, G.A.F., Lagorce, D., Miteva, M.A., Villoutreix, B.O., Sperandio, O.
Extracellular histone H3 levels are inversely correlated with antithrombin levels and platelet counts and are associated with mortality in sepsis patients. Wildhagen, K.C.A.A., Wiewel, M.A., Schultz, M.J., Horn, J., Schrijver, R., Reutelingsperger, C.P.M., van der Poll, T., Nicolaes, G.A.F. Identification of small molecule inhibitors against SecA by structure-based virtual ligand screening. De Waelheyns, E., Segers, K., Sardis, M., Anné, J., Nicolaes, G.A.F. and Economou, A. Targeting the adaptive immune system: new strategies in the treatment of atherosclerosis. Zarzycka, B., Nicolaes, G.A.F., Lutgens, E.
Two Novel Mutations in the SLC25A4 Gene in a Patient with Mitochondrial Myopathy. Körver-Keularts IM, de Visser M, Bakker HD, Wanders RJ, Vansenne F, Scholte HR, Dorland L, Nicolaes GAF, Spaapen LM, Smeets HJ, Hendrickx AT, van den Bosch BJ. Discovery of small molecule CD40-TRAF6 inhibitors. Zarzycka, B., Seijkens, T., Nabuurs, S.B., Ritschel, T., Grommes, J., Soehnlein, O., Schrijver, R., van Tiel, C.M., Hackeng, T.M., Weber, C., Giehler, F., Kieser, A., Lutgens, E., Vriend, G. and Nicolaes, G.A.F. Molecular simulation studies of human coagulation factor VIII C domain-mediated membrane binding. Du, J., Wichapong, K., Hackeng, T. and Nicolaes, G.A.F. The Structure Function of the Death Domain of human IRAK-M.
Du, J., Nicolaes, G.A.F., Kruijswijk, D., Versloot, M., van der Poll, T. and van ’t Veer, C.
Blocking CD40-Traf6 interactions by small molecule inhibitor 6860766 ameliorates the complications of diet induced obesity in mice. Van den Berg, S., Seijkens, T., Kusters, P., Zarzycka, B., Beckers, L., den Toom, M., Gijbels, M., Chatzigeorgiou, A., Weber, C., de Winther, M., Chavakis, T., Nicolaes, G.A.F. and Lutgens, E.
Understanding the functional difference between growth arrest-specific protein 6 (GAS6) and protein S (PROS1): an evolutionary approach. Studer, R.A., Opperdoes, F.R., Nicolaes, G.A.F., Mulder, A.B. and Mulder, R.
Factor Va alternative conformation reconstruction using Atomic Force Microscopy. Effects of exogenous recombinant APC in mouse models of ischemia reperfusion injury and of atherosclerosis. Wildhagen, K.C.A.A., Schrijver, R., Beckers, L., ten Cate, H., Reutelingsperger, C.P., Lutgens, E., Nicolaes, G.A.F. Sperandio, O.,Wildhagen, K.C.A.A., Schrijver, R., Wielders, S., Villoutreix, B.O., Nicolaes, G.A.F. Blocking CD40‐TRAF6 signaling is a novel therapeutic target in obesity‐associated insulin resistance. Non-anticoagulant heparin prevents histone-mediated cytotoxicity in vitro and improves survival in sepsis. Wildhagen, K.C.A.A., García de Frutos, P., Reutelingsperger, C.P., Schrijver, R., Aresté, C., Ortega-Gómez, A., Deckers, N.M., Hemker, H.C., Soehnlein, O., Nicolaes, G.A.F. Nicolaes, G.A.F., Kulharia, M., Voorberg, J., Kaijen, P.H., Wroblewska, A., Wielders, S., Schrijver, R., Sperandio, O., Villoutreix, B.O. Optimization of compound ranking for structure-based virtual ligand screening using an established FRED-Surflex consensus approach. Du, J., Bleylevens, I.W.M., Bitorina, A.V., Wichapong, K., Nicolaes, G.A.F. Factor Xa-induced activation of factor V is of paramount importance in initiating the coagulation system: lessons from a tick salivary protein. Schuijt, T.J., Bakhtiari, K., Daffre, S., DePonte, K., Wielders, S.J.H., Marquart, J.A., Hovius, J.W., van der Poll, T., Fikrig, E., Bunce, M.W., Camire, R.M., Nicolaes, G.A.F., Meijers, J.C.M. and van ’t Veer, C.
Two novel mutations in the prothrombin gene identified in a patient with compound heterozygous type 1/2 prothrombin deficiency. Kuijper P.H., Schellings M.W., van de Kerkhof D., Nicolaes G.A.F., Reitsma P., Halbertsma F., Dors N.
Sanders MP, Barbosa AJ, Zarzycka B, Nicolaes GA, Klomp JP, de Vlieg J, Del Rio A.
Goodpasture Antigen-binding Protein/ceramide Transporter Binds to Human Serum Amyloid P-component and is presentin Brain Amyloid Plaques. Mencarelli C, Bode GH, Losen M, Kulharia M, Molenaar PC, Veerhuis R, Steinbusch HW, De Baets MH, Nicolaes GAF, Martinez-Martinez P.
De structuur-functie relatie van geactiveerd protein C: wat mutaties ons kunnen leren. Wildhagen, K.C.A.A., Lutgens, E., Loubele S.T.B.G., ten Cate, H.,Nicolaes, G.A.F. The structure-function relationship of activated protein C: lessons from natural and engineered mutations. Wildhagen K.C.A.A., Lutgens E., Loubele S.T.G.B, ten Cate H and Nicolaes G.A.F. Engineered annexin A5 variants with impaired cell entry for molecular imaging of apoptosis using pretargeting strategies. Ungethum L., Kenis H., Nicolaes G.A.F., Autin L., Stoilova-McPhie S., Reutelingsperger C.P. Riboflavin-responsive oxidative phosphorylation complex I deficiency caused by defective ACAD9: new function for an old gene. Gerards M., van den Bosch B.J., Danhauser K., Serre V., van Weeghel M., Wanders R.J., Nicolaes G.A.F., Sluiter W., Schoonderwoerd K., Scholte H.R., Prokisch H., Rötig A., de Coo I.F., Smeets H.J. Trp2313-His2315 of the FVIII C2 domain are involved in membrane binding: Structural analysis of a complex between the C2 domain and an inhibitor of membrane binding. Liu, Z., Lin, L., Yuan, C., Nicolaes, G.A.F., Chen, L., Meehan, E.J., Furie, B., Furie, B., Huang, M.
Inhibition of thrombin formation by active site Ser360 to Ala-substituted activated protein C.
Nicolaes, G.A.F., Bock, P.E., Segers, K., Wildhagen, K.C.A.A., Dahlback, B., Rosing, J. The D2194G mutation is responsible for increased levels of FV1 in carriers of the factor V R2 haplotype. Yamazaki, T. Okada, H., Balling, K.W., Dahlbäck, B., Nicolaes, G.A.F. FVIII-eGFP fusion proteins with preserved functional activity for the analysis of the early secretory pathway of FVIII. Heinz, S., Schüttrumpf, J., Simpson, J.C., Pepperkok, R., Nicolaes, G.A.F., Seifried, E., Tonn, T.
Factor IX Mutants with Enhanced Catalytic Activity. Hartmann, R., Dockal, M., Kammlander, W., Fiedler, C., Panholzer, E., Nicolaes, G.A.F., Rosing, J. and Scheiflinger, F.
Multimerin 1 inhibits thrombin generation and binds factor V and Va with high affinity. Jeimy, S.B., Fuller, N., Quin-Allen, M.A., Tasneem, S. Segers, K., Stafford, A.R., Weitz, J.I., Camire, R.M., Nicolaes, G.A.F., Kane, W.H., Hayward, C.P.M. Screening Outside the Catalytic Site: Inhibition of Macromolecular Inter-actions Through Structure-Based Virtual Ligand Screening Experiments. Sperandio O, Miteva MA, Segers K, Nicolaes GA, Villoutreix BO. Identification of surface epitopes of human coagulation factor Va which are important for interaction with activated protein C and heparin. Segers, K., Dahlbäck, B., Rosing, J., Nicolaes, G.A.F. Re-evaluation of the role of the protein S-C4b binding protein complex in activated protein C-catalyzed factor Va-inactivation. Maurissen, L.F.A., Thomassen, M.C.L.G.D., Nicolaes, G.A.F., Dahlbäck, B., Tans, G., Rosing, J. and Hackeng, T.M. PROS1 Analysis in 87 Pedigrees with Hereditary Protein S Deficiency Demonstrates Striking Genotype-Phenotype Associations. ten Kate, M., Platteel, M., Mulder, R., Terpstra, P. Nicolaes, G.A.F., Reitsma, P., van der Steege, G., van der Meer, J. Defining the structure of membrane-bound human blood coagulation Factor Va.
Stoilova-McPhie, S., Awosile. F., Parmenter, C.D.J., Segers, K., Villoutreix, B.O., Nicolaes, G.A.F. The role of thrombin exosites I and II in the activation of human coagulation factor V.
Segers, K., Dahlbäck, B., Bock, P.E., Tans, G.,Rosing, J., Nicolaes, G.A.F. Coagulation factor V and thrombophilia: background and mechanisms. Segers, K., Dahlbäck, B., Nicolaes, G.A.F. 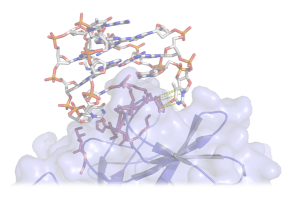 Design of protein-membrane interaction inhibitors by virtual ligand screening, proof of concept with the C2 domain of factor V.
Segers, K., Sperandio, O., Sack, M., Fischer, R., Miteva, M., Rosing, J., Nicolaes, G.A.F., Villoutreix, B.O. Expression of allosteric linkage between the sodium ion binding site and exosite I of thrombin during prothrombin activation. Kroh, H.K., Tans, G., Nicolaes, G.A.F., Rosing, J., Bock, P.E. Biochemical, molecular characterization and glyco-proteomic analyses of alpha1-proteinase inhibitor products used for replacement therapy. Kolarich, D., Turecek, P.L., Weber, A., Mitterer, A., Graninger, M., Matthiessen, P., Nicolaes, G.A.F., Altmann, F., Schwarz, H.P. A structural model of the SHBG domain of human variant protein S Heerlen. Nicolaes, G.A.F., Hackeng, T.M., Segers, K., Rosing, J. Structural Models of the Snake Venom Factor V activators from Daboia russelli and Daboia lebetina. Segers, K., Rosing, J., Nicolaes, G.A.F. Activation of Factor V by Venom Proteases. Identification of the MMRN1 binding region within the C2 domain of human factor V.
Jeimy, S.B., Woram, R.A., Fuller, N., Quinn-Allen, M.A., Nicolaes, G.A.F., Dahlbäck, B., Kane, W.H., Hayward, C.P. Altered inactivation pathway of factor Va by activated protein C in the presence of heparin. Nicolaes G.A.F., Sörensen, K.W., Friedrich, U., Tans, G., Rosing, J., Autin L. , Dahlbäck B., Villoutreix B.O. Impaired APC-cofactor activity of factor V is a major component of the APC resistance associated with the FV Leiden (R506Q) and R2 (H1299R) mutations. Castoldi, E., Brugge, J.M., Nicolaes, G.A.F., Tans, G., Rosing, J.
Functional Properties of Recombinant Factor V mutated in a Potential Calcium-Binding Site. Sörensen, K.W., Nicolaes, G.A.F., Villoutreix, B.O., Yamazaki, T., Tans, G., Rosing, J., Dahlbäck, B.
Welke factor laat ons bloed stollen? Theoretical and experimental study of the Asp2194Gly mutation in the C2 domain of coagulation factor V.
Miteva, M.A., Brugge, J.M., Rosing, J., Nicolaes, G.A.F., Villoutreix, B.O. Congenital and Acquired Activated Protein C Resistance. Activated protein C resistance (FVLeiden) and thrombosis: factor V mutations causing hypercoagulable states. Structure-function studies of blood coagulation proteins using recombinant human factor V molecules. Nicolaes, G.A.F., Tans, G., Rosing, J. Progress Report CARIM, University Maastricht (2002) 50-54. Molecular basis of quantitative factor V deficiency associated with factor V R2 haplotype. Yamazaki, T., Nicolaes, G.A.F., Winther Sørensen, K., Dahlbäck, B. Reduced factor V concentration and altered factor V1/factor V2 ratio do not fully explain R2-associated APC-resistance. Govers-Riemslag, J., Castoldi, E., Nicolaes, G.A.F., Tans, G., Rosing, J. Factor V and Thrombotic disease: description of a Janus-faced protein. Introduction to structural bioinformatics; applications to blood coagulation factor V and factor VIII. Friedrich U., Nicolaes G.A.F., Villoutreix B.O., Dahlbäck B. The second Laminin G-type domain of protein S is indispensable for full cofactor activity in activated protein C-catalyzed inactivation of factor Va and factor VIIIa. Evenäs, P., Garcia de Frutos, P., Nicolaes, G.A.F., Dahlbäck, B.
Mutations in a potential phospholipid binding loop in the C2 domain of factor V affecting the assembly of the prothrombinase complex. Nicolaes, G.A.F., Villoutreix, B.O., Dahlbäck, B. Acquired APC resistance and oral contraceptives: A randomised cross-over study of two low dose oral contraceptives. Rosing, J., Middeldorp, S., Curvers, J., Thomassen, M.C.L.G.D., Nicolaes, G.A.F., Meijers, J., Bouma, B.N., Büller, H.R., Prins, M.H., Tans, G.
Partial glycosylation of Asn2181 in human factor V as cause of molecular and functional heterogeneity. Acquired APC resistance and oral contraceptives: Differences between two functional tests. Curvers, J., Thomassen, M.C.L.G.D., Nicolaes, G.A.F., van Oerle, R., Hamulyak, K., Hemker, H.C., Tans, G., Rosing, J. Regulation of thrombin formation by activated protein C: effect of the FVLeiden mutation. Tans, G., Nicolaes, G.A.F., Rosing, J. Human factor Va1 and Va2: Properties in the procoagulant- and anticoagulant pathways. Hoekema, L, Nicolaes, G.A.F., Tans, G., Hemker, H.C., Rosing, J. Oral Contraceptives and venous thrombosis: different sensitivities to activated protein C in women using second and third generation oral contraceptives. Rosing, J., Tans, G., Nicolaes, G.A.F., Thomassen M.C.L.G.D., Van Oerle, R., Van der Ploeg, P.M.E.N., Heijnen, P., Hamulyak, K., Hemker, H.C.
Effect of activated protein C on thrombin generation and on the thrombin potential in the plasma of normal and APC resistant individuals. Nicolaes, G.A.F., Thomassen, M.C.L.G.D., Tans, G., Rosing, J., Hemker, H.C.
A prothrombinase-based assay for detection of resistance to activated protein C.
Nicolaes, G.A.F., Thomassen, M.C.L.G.D., van Oerle, R., Hamulyak, K., Hemker, H.C., Tans, G., Rosing, J. Effects of protein S and factor Xa on peptide bond cleavages during inactivation of factor Va and factor VaR506Q by activated protein C.
Rosing, J., Hoekema, L., Nicolaes, G.A.F., Thomassen, M.C.L.G.D., Hemker, H.C., Varadi, K., Schwarz, H.P., Tans, G.
Nicolaes, G.A.F., Tans, G., Thomassen, M.C.L.G.D., Hemker, H.C., Pabinger, I., Varadi, K., Schwarz, H.P., Rosing, J.
Activation of human factor V by meizothrombin. Tans,G., Nicolaes, G.A.F., Thomassen, M.C.L.G.D., Hemker, H.C., van Zonneveld, A-J., Pannekoek, H., Rosing, J.
Acylation of porcine pancreatic PLA2 influences penetration and substrate head- group binding, depending on the position of the acylated lysine in the enzyme molecule. Lugtigheid, R.B., Nicolaes, G.A.F., Veldhuizen, E.J.A., Slotboom, A.J., Verheij, H.M., de Haas, G.H.